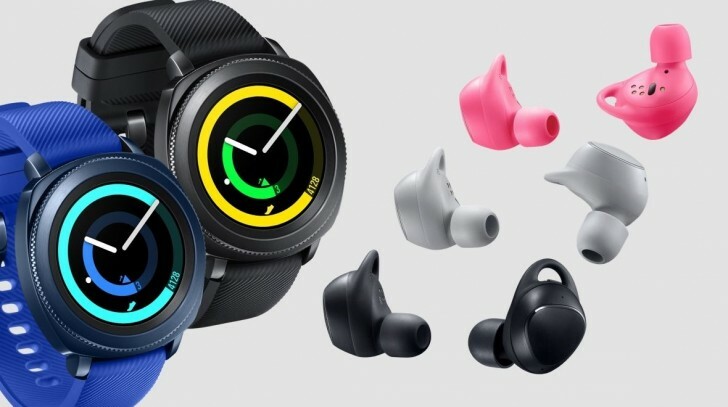 Samsung announced the Gear Sport round smartwatch and Gear IconX (2018) true wireless earbuds alongside the Gear Fit2 Pro fitness band at the end of August. Of the three products, only the latter has already become available, but it will soon be joined by the other two. Today the Korean company has unveiled that pre-orders for the Gear Sport and Gear IconX (2018) will start tomorrow, on October 13, in the US. Both devices will be available on October 27. You will be required to pay $299.99 for a Gear Sport smartwatch, which can be yours in blue and black. Samsung.com and BestBuy.com will be taking pre-orders, while Amazon, Macy's, and US Cellular will offer it from its release date. The Gear Sport has 5 ATM water resistance, built-in swim tracking, real-time heart rate monitoring, auto activity detection, and support for Spotify's offline mode. Like its most recent Gear S series siblings, it comes with a circular bezel that enhances navigation. The Gear IconX (2018) earbuds come in gray, pink, and black, and feature up to five hours of Bluetooth streaming. They will cost $199.99, with pre-orders taking off at Samsung's online store. Come October 27, you will find them at Amazon, Best Buy, Sprint, and US Cellular too. Yes, 5 hours of audio streaming on the IconX is well worth the buy - this I'm getting even with the hefty price. The fact the Gear Sport watch can store Spotify downloads is something as well.